With the imminent demographic shifts in our society and the need to prepare students for citizenship in a global, knowledge-based society, the role of the academic department chair in creating diverse and inclusive learning environments is arguably the most pivotal position in higher education today. In the United States, increasing minority student enrollment coupled with the emergence of a minority majority American nation by 2042 demands that academic institutions be responsive to these changing demographics. The isolation of the ivory tower is no longer an option. This is the first book to address the role of the department chair in diversity and addresses an unmet need by providing a research-based, systematic approach to diversity leadership in the academic department based upon survey findings and in-person interviews. The department chair represents the nexus between the faculty and the administration and is positioned uniquely to impact diversity progress. Research indicates that more than 80 percent of academic decisions regarding appointment, curriculum, tenure and promotion, classroom pedagogy, and student outcomes are made by the department chair in consultation with the faculty. This book examines the multidimensional contributions that chairs make in advancing diversity within their departments and institutions in the representation of diverse faculty and staff; in tenure and promotion; curricular change; student learning outcomes; and departmental climate. The scope and content of the book is not limited to institutions in the United States but is applicable to academic institutions globally in their efforts to address the access and success of increasingly diverse student populations. It addresses institutional power structures and the role of the dean in relation to the appointment of chairs and their impact on the success of chairs from non-dominant groups, including female, minority, and lesbian/gay/transgendered individuals who serve in predominantly white male departments. Using qualitative and quantitative research methods, the book analyzes predominant structural and behavioral barriers that can impede diversity progress within the academic department. It then focuses upon the opportunities and challenges chairs face in their collaborative journey with faculty and administration toward inclusive departmental and institutional practices. Each chapter provides concrete strategies that chairs can use to strengthen diversity in the academic department. Addressed to department chairs, deans, faculty, and administrative leaders in higher education in all Western societies facing demographic change and global challenges, this book offers a critical road map to creating the successful academic institutions that will meet the needs of our changing populations. “Edna Chun and Alvin Evans’ work on the department chair and diversity fills a gap in the literature on academic leadership. They argue that the academic chair is the pivot for diversity in higher education, particularly as increasing numbers of minoritized students enter the academy. Student diversity contrasts with the overwhelming white maleness of academic administrators, including 90 percent of chairs. Nevertheless, chairs are poised to enhance both the student experience of diversity and diverse faculty diversity development. The authors used an online survey and interviewed chairs across the nation to assess the current level of progress in diversity, to address barriers to diversity, to understand environmental factors that can promote or impede diversity, and to articulate strategies for developing diversity. They were particularly interested in talking with minoritized chairs and in the impact of diversity on student learning. By diversity, they mean race and ethnicity as well as gender and sexual orientation. "Edna Chun and Alvin Evans recognize the pivotal role that department heads and departments play in the structure, culture and climate of our colleges and universities. For diversity and inclusion efforts to really make progress, they must be nurtured and implemented at the grassroots level in each department where personnel decisions are made." “The literature on academic leadership and diversity is silent. While a proliferation of new books have been published on the challenges and skills needed to effectively lead a departments, none of the books have directly addressed the issue of building an inclusive department and advancing diversity. This book moves well beyond the usual book on diversity--or department chair development. It blends the two into a powerful and authoritative resource guide for academic leaders: (1) a conceptual framework for understanding the importance and challenge of diversity; and (2) practical strategies gleaned from their qualitative research with department chairs. It is a compendium of important insights and essential information for championing the cause of diversity and effective leadership. "Regardless of the institution where you are, this groundbreaking book is a must read for all department chairs seeking concrete tools and strategies for successfully implementing diversity in their departments. It provides practical, research-based approaches representative of best practices from across the United States. 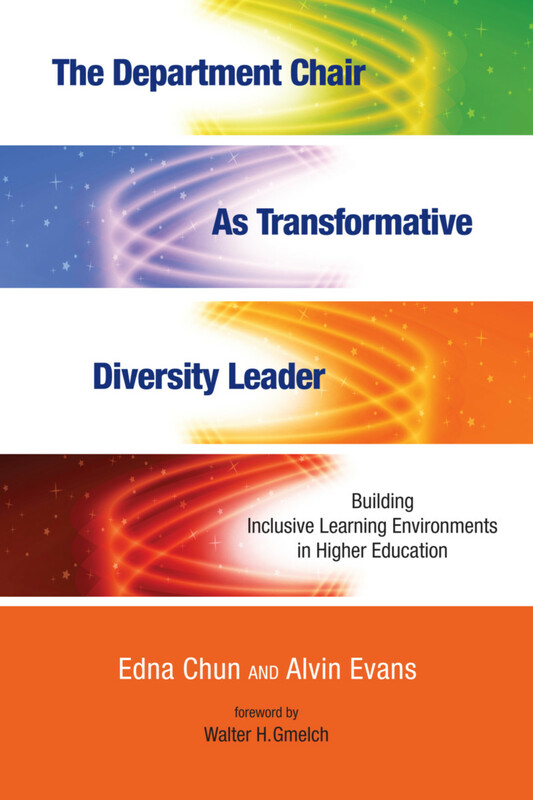 Additionally, this book will be a useful tool for faculty, deans, provosts and others working with department chairs who wish to advance the process of diversity transformation." Alvin Evans and Edna Chun are award-winning authors and human resource and diversity thought leaders with extensive experience in complex, multi-campus systems of higher education. Two of their books, Are the Walls Really Down? Behavioral and Organizational Barriers to Faculty and Staff Diversity (Jossey-Bass, 2007) and Bridging the Diversity Divide:Globalization and Reciprocal Empowerment in Higher Education (Jossey-Bass, 2009) were recipients of the prestigious Kathryn G. Hansen Publication Award by the national College and University Professional Association for Human Resources. In addition, their co-authored book, The New Talent Acquisition Frontier: Integrating HR and Diversity Strategy in the Private and Public Sectors and Higher Education (Stylus: 2014) received a silver medal in the 2014 Axiom Business Book Awards and is the first book to provide a concrete roadmap to the integration of HR and diversity strategy.